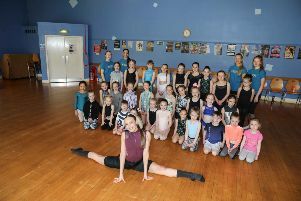 Dancing teenager Serena McCall is coming home this month to host a series of charity workshops to raise funds for a young cancer sufferer. All cash will go to Brae’s schoolgirl Ashlee Easton’s Neuroblastoma Appeal. Serena (15), who previously attended both Central Scotland Ballet School and Royal Ballet School, is currently studying full time at Elmhurst Ballet School in Birmingham, a world renowned centre of excellence for the training and education of ballet dancers. The former St Mungo’s pupil, from Rumford, is hugely popular on social media, with over 36,000 followers on Instagram and has worked with big names in the dance industry such as Dance Mom’s Abby Lee Miller, So You Think You Can Dance choreographer, Travis Wall and Ricky Jinks from The Greatest Dancer. Serena travels all over the world taking part in high profile projects and inspiring young dancers everywhere. The talented teen is taking time out of her busy schedule to return home for Easter to deliver a series of workshops for Ashlee’s appeal. Ashlee (12), also from the Braes, was just six when she was diagnosed with high-risk neuroblastoma, a rare form of cancer. Unfortunately she recently suffered a relapse and is undergoing chemotherapy treatment. Ashlee’s family are raising funds in case she needs to access further treatment not available on the NHS. Already the appeal has raised almost £14,000 and Serena hopes to add to this amount through her Easter workshops on April 19 at FTH Theatre. Participants will learn lyrical choreography from Serena and there will also be photo opportunities and question and answer sessions. Serena’s mum, Shona, who runs Piccolina Childrenswear shop in Falkirk, said: “The whole family is so proud of Serena. “She’s extremely talented but she’s also a truly lovely, humble, down to earth young girl and she’s really excited to be coming home and delivering these workshops. “She has always said she wants to give something back to Falkirk and, as she knows Ashlee, she felt this was an ideal way to do that while raising money for such an important cause. “Thanks also to Central Scotland Ballet School for their help organising the workshops. “Ashlee’s mum has been in touch and has said she’s very touched which is so nice to hear. To book one of Serena’s workshops email info@centralscotlandballetschool.co.uk.